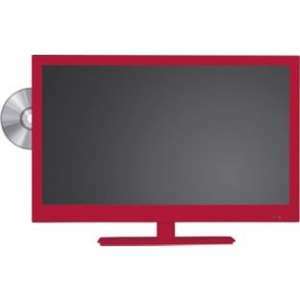 With integrated Freeview digital tuner this sleek red 22" Alba TV offers access to all your TV channels, as well as providing a built-in DVD player to view your favourite movies. Features such as an auto channel scan and 7-day electronic programme guide makes this HD Ready TV great for any bedroom or kitchen. Full HD 1080p display resolution. 1 HDMI socket and 1 SCART socket. 2 x 2 watts RMS power output. Size of TV H33.8, W52.1, D5.2cm. Weight of TV 3.57kg (unpackaged). Size of TV with stand H37.5, W52.1, D16.8cm. Weight of TV with stand 3.81kg. Suitable for wall mounting 100 x 100 bracket. On mode power consumption 19 watts. Only red and blue are that price, the others are 120-125 !